I met the very talented director Alejandro Adams and his brilliantly artistic wife Marya Murphy at Cinequest this year. Their second film Canary had its premiere there and had a greatly divided audience reaction. I was in the “I LOVE IT” camp and am still quite fascinated with its meaning and implications three months later. Their first film, Around the Bay, was highly regarded at a previous Cinequest and by critics everywhere, and will be showing again at the Niles Essanay Silent Film Museum on June 12. I was not able to view it at Cinequest and am quite excited to see it in June. Their third film Babnik is currently in post production. Alejandro and Marya have kept in touch with me since the festival and I knew they were preparing to begin their fourth film, Amity. 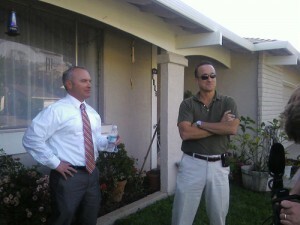 So when Marya recently asked if they could use the front of my house to shoot some scenes I jumped at the chance. I had no desire to be in the film myself, but I am a firm believer in Alejandro’s genius and was honored to be able to help. I offered to supply refreshments while they were there and just planned to stay out of the way as much as possible. Of course, the reality of having your house in a film shoot in June means that you should finally take down the Christmas lights that are still hanging, and wash off the fake window snow (oops). Also make sure your lawn is mowed, flowers trimmed, driveway swept, porch washed and cars parked elsewhere. In addition, the cast and crew need access to a bathroom, and don’t forget you volunteered to provide snacks. It was a lot of hard, happy-to-help work getting the house prepared. The crew arrived just before three in the afternoon on Saturday. Director/writer Alejandro Adams arrived with Production Assistant Susan Cochran and crew Sam Lopez and Ali Allie. Marya Murphy and actors Greg Cala, Michael Uimari and Peter Runyon (who also supplied the limo for the shoot) arrived a few minutes later. 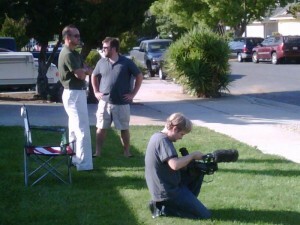 They immediately started setting up their equipment on the front lawn and made decisions on what else needed to be done. We moved cars away from the front of the house, we moved cars away from across the street, and we re-arranged the snack tables. 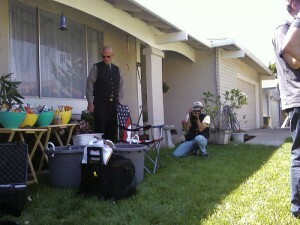 Alejandro placed a chair in the middle of the lawn for a prop, and they started setting up their shots for the scene. This is where the problems of movie making became evident. After moving all cars away from the house, including pushing a car with a dead battery out of the way, up pulled the mail carrier to the front of the house where she always parks. I ran over and asked if she could please move the truck, as we needed the area for the limo. She gave me a really irritated look, pulled the truck over across the street, and for the record, I didn’t receive any mail yesterday. Hmmm. The scene they were shooting was not more than five minutes long, but the process actually took from 3pm until after 6pm. The experience was pretty much exactly as I had expected, mostly a lot of sit around and wait, but it was still interesting. They filmed in the yard and they filmed inside the limo, but we outsiders could only hear the very small bits that happened on the lawn. For this reason I could not tell you a whole lot about the movie itself, but I can certainly tell you that I cannot WAIT to find out what was going on inside that limo. It was all very secretive and kind of creepy, with three tough looking men getting into and out of the limo and a mysterious cell phone being passed back and forth through a window. From the film’s website [not currently online] you can read that Amity is a testosterone-driven but poignant character study about a divorced Air Force sergeant (Greg Cala) who rents a limousine to celebrate his daughter’s high school graduation but ends up spending the evening with the limo driver (Michael Uimari), a former Army grunt who is also divorced. I can’t tell you much about the scene that I saw, but I can tell you the various problems we came up against on a relatively quiet day. From the neighbor’s air conditioning unit that cycled loudly on and off to the low flying planes from Reid Hillview airport, there were constant little things that you never think about. Also, I will never again look down on films that have editing goofs, seeing now how incredibly impossible it is to keep control of everything around you. 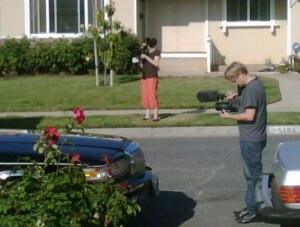 We had various neighbors’ parked cars moved in and out of shots, and even the prop beer bottle they used was often forgotten in the scene. The next door neighbor coming out to check her mail in the noisiest way possible, the neighbor’s loud car pulling into the driveway and honking the horn, a big loud truck drive past, and the neighbor across the street coming out of their house right into the shot and standing to stare at what was going on before finally getting in their car and driving away. All of that in less than a three minute period of time. I laughed with the sound man, because what else are you going to do? Except do it all over again. And again, and again. For sure, making a movie on an open set is not easy. 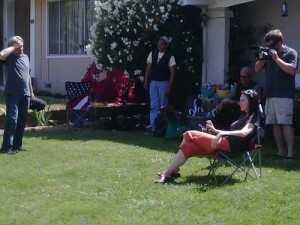 We had gardeners, hammers, loud birds, some dogs barking and fighting nonstop down the street, motorcycles driving past, and neighborhood teenagers stopping to gawk right in front of the cameras. But it wasn’t only outside noise that was a problem. The air conditioner in the limo had to be turned off during filming because of the noise. So they would run the AC for a couple minutes to cool it down, turn it off and start filming, and then jump out covered in sweat a few minutes later. Marya’s glasses kept fogging up and the poor actors were stuck in suits and ties. No, being on a film set is not that exciting, and being privy to the least action packed portion of a scene which was shot over and over and over again might seem like a boring afternoon. However, having seen their previous film Canary and having heard such wonderful praise for Around the Bay, I could not help but feel that I was part of something exciting and important in the film world. You should keep an eye on this powerhouse couple of Adams and Murphy; the film world is already taking notice, it won’t take long before viewers everywhere become enamored/enraged/intrigued/incensed/captivated with them too.